Being punched in the head for a living is an odd career choice. Watching people being punched in the head, however, can be fascinating. 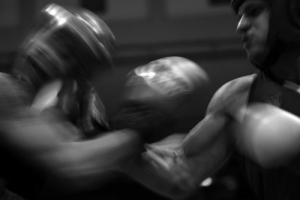 Boxing is pure competition — one-on-one, in the ring. It is a core Olympic event, testing endurance, tactical nous and speed in a savage battle. One wrong move and you could be unconscious on the canvas. Boxing is often compared to chess as it relies heavily on forward planning, outthinking one's opponent. The fighter must look five punches ahead. To many it may look like mindless fury, but it's a sport that relies far more on technique and tactics than brawn and blood lust. In the Olympics this is particularly noticeable as points are gained through clean blows landed rather than physical damage caused. London 2012 is a landmark for boxing at the Olympics as women have finally been allowed to compete in the ring, only 108 years after men were first permitted to slug it out at the Games. Did you know that boxing was banned at the 1912 Stockholm Games because the sport was illegal in Sweden. The weight divisions range from the tiny, waspish light flyweights to the Goliaths of the super heavyweight category. Female boxers contest four 2-minute rounds, whereas the male competition is over three 3-minute rounds. The fights are judged by five officials at ringside, and when a blow is landed, if three of the panel hit electronic buttons within a second of each other, the boxer is awarded a point. Success at the Olympics has been a springboard for a number of future world champions including meat-griller George Foreman, 'Golden Boy' Oscar De La Hoya, and Muhammed Ali who tasted success in Rome in 1960 under his original name Cassius Clay. Nicola Adams — The flyweight from Leeds had to recover from a broken back in 2009, suffered when she fell down the stairs. Adams is bubbly and charismatic, but behind the beaming smile lies a gritty, clever fighter with an electric jab and quick feet. A gold medal would cap a remarkable comeback. Anthony Joshua — Finchley-born Joshua has enjoyed a rapid rise to potential super-heavyweight champion. Last year he won a silver medal at the World Championships, and looks set to go one better in his home city this summer. A rangy fighter with a powerful straight jab, London 2012 could be the start of a special career. The boxing event takes place at the ExCel Centre, and some tickets are still available. We’re bringing you the Londonist lowdown on all Olympic and Paralympic sports in the run up to London 2012. Photo by "vapo".